Here at SecureFix Direct we offer a great range of ratchet loadbinders that are designed for use with chain lashings for heavy load securing. Perfect for us in transport, haulage, plant and machine moving as well as agricultural applications, our loadbinders are extremely versatile and easy to use. We understand the need for durability when it comes to heavy duty equipment and so we drop forge all of our ratchet loadbinders. This ensures that they are a lot stronger than regular loadbinders, guaranteeing a long working life. 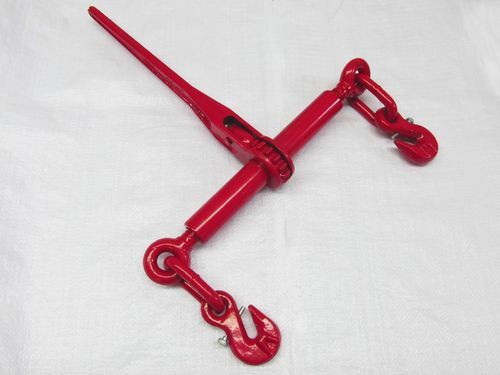 Our ratchet loadbinders are extremely easy to use, and all you have to do is simply pull on the ratchet handle to remove all slack from the chain, to make goods ready to go. We stock a variety of different ratchet load binders, some with a safety grab hook and some without, available in different sizes in order to maximise the versatility of the product. The safety grab hooks offer higher levels of safety when it comes to securing and transporting loads. Why Choose SecureFix Direct For Your Ratchet Loadbinders? Your safety is of the utmost importance to us as a company, and so we ensure that we provide you with extra safety measures, such as the safety grab hooks on our ratchet loadbinders. If you’re looking for resilient and versatile heavy load securing equipment then our ratchet loadbinders are perfect for you. We have proven experience over many years of trading in the industry, and guarantee to continually provide you with the highest quality equipment at some of the best prices on the market. We also offer a free express delivery service on our entire range, which comes complete with fast despatch so you can be sure to get your products as soon as possible. If we receive your order by 12pm, we will also despatch the same day to further speed up your buying process. We are determined to provide the highest levels of customer service to give you the ultimate buying experience. If you have any questions regarding our range of ratchet loadbinders or any other products on our site, don’t hesitate to get in touch with a friendly member of our team today.